The idiom "whistling past the graveyard" has two meanings associated with it: it may mean attempting to remain happy and optimistic despite proceeding into a bad situation or it may mean remaining ignorant of possible consequences while entering into a difficult situation. 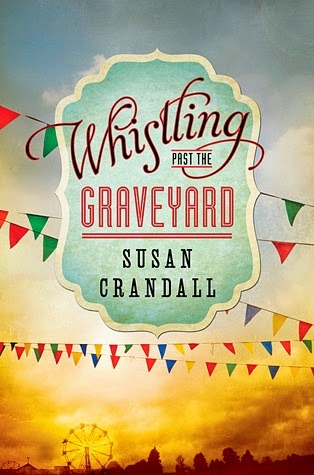 Starla says that whistling past the graveyard is "when you did something to keep your mind off your most worstest fear." I think this book illustrates all of these meanings beautifully and was well titled by Crandall. Although many have called this a 'coming of age' story, I felt that is was more of a 'coming of adolescent' story, because Starla is only nine years old and as the story progresses I think she is simply learning how to think more critically about her surroundings, not necessarily becoming an adult, which is what I usually associate with the trope 'coming of age.' Starla slowly learns how to think about consequences when she gets into new situations, because she makes the mistake of not thinking about them more than once throughout her story. She often does try to remain optimistic while going through difficult situations, believing that it will all work out even when things snowball or go terribly wrong. Starla is a vibrant character, one that will take hold of you and won't let go until her whole story has been told. I enjoyed the journey with her and liked Starla's southern accent, as well as her grammatical errors and silly misinterpretations (like assault with batteries), which consistently reminded me that I was following a child through this adventure and seeing the world through her young eyes. Although Starla is a vibrant character, I felt that the rest of the characters remained distant and underdeveloped. One could argue that this was done on purpose because the story is written in Starla's point of view, children are ego-centric and most of the time are not very observant about the adults around them. Even if this was the case, however, I would be left feeling that the characters needed more to them in order to believe some of the plot points as well. This is the risk of taking on such adult themes through the eyes of a child, who does not understand all that is going on, even if the child does learn via the experiences in the book and understands by the end. Whistling Past the Graveyard lacks poignant insight that I desperately wanted to be there. I did find several scenes to be insightful and interesting, with topics brought up in ways that did surprise me, at one point Starla thinks, "All of a sudden the whiteness of my skin made me too ashamed." I'm sure that as an individual, no matter the age, began to grasp the concept of Jim Crow laws and the impact they had on the world during that time period then he/she would begin to feel ashamed of being white too. I wanted more from Eula's character and her story, but again I understand that Starla's character both maximized my desire to remain invested in the novel and minimized the information I was going to get from it. Overall I felt that this book was worth the read and recommend it to anyone who liked the novels The Secret Life of Bees and The Help, or similar historical fiction pieces, but I'm not planning on reading it again. I recommend eating/drinking a cherry snow cone with this book. It is close to the Fourth of July now, it is hot, and Starla looked forward to having one of these when she went to the Fourth of July festivities herself. There were a few times while reading that I was reminded of the heat and how welcome a refreshing cherry snow cone would be.